The market for domestic boilers has decreased by nearly 2% while the heat pump market has grown by 6% in 2015. The market for commercial boilers has remained flat overall, while the commercial heat-pump market grew by 20% in 2015. Do these growth rates mean that the UK heating market has found its way towards renewables after all? Growth rates are certainly telling a story, and positive growth for heat pumps certainly gives reason for optimism in the future. Nevertheless the decrease of the boiler market and increase of heat pumps need to be considered in relation to the numbers of units sold, and a closer look at those gives no reason for big celebrations. A total of 1 685 700 boilers were sold in 2015, compared with the 2014 figure of 1 712 500. The decrease of the market has been attributed to the cancellation of the Green Deal that saw cashback given also for the installation of new boilers and to the reducing impact of the Energy Companies Obligation (ECO) scheme that has added some 170 000 units to the sales in 2013 and another 30 000 in early 2014; in fact if the numbers of ECO-installed boilers is subtracted from, respectively, 2014 and 2015, the boiler market would show a completely flat performance. Sales of residential biomass boilers decreased by 33% in 2015 after a significant surge recorded in 2014. Biomass boilers became eligible for the domestic Renewable Heat Incentive (RHI) in April 2014, which made them instantly attractive to customers in rural areas where mains gas is not available. Under the initial RHI tariffs, a typical boiler could reach a payback of four years. Larger units, for properties of five bedrooms would, have a shorter payback period (as RHI favoured bigger installations). With RHI’s biomass expenditure exceeding its threshold, successive cuts in biomass tariffs were implemented, which led to the significant sales decrease in 2015. In 2015 a total of 20 570 heat pumps were sold, compared with of 19 540 in 2014 when the introduction of long-awaited domestic RHI scheme has caused a decrease of 12% year on year, sending the actual sales of heat pumps back, close to the 2010 level. Despite the positive development recorded in 2015, heat-pump sales have not even reached the 2013 level. Rebalancing of tariffs in the RHI scheme and the Government confirmation of the funding for the scheme during the next five years have not so far given the market a sufficient boost, and in 2016 the sales of heat pumps are likely to decrease again. Heat pumps are equally installed in both new and existing dwellings. Their main strongholds are social housing and off-mains gas properties, where they compete against biomass and oil boilers. Heat pumps benefited from the successive reductions of the RHI tariff for biomass boilers, and the increase in the new-build construction has equally contributed to the 2015 market growth. However disappointing changes in 2013 Building Regulations that did only stipulate a 6% improvement in CO2 emission level towards the previous standards, as well as drop by the Government of the 2016 Zero Carbon Home standard, have curbed the potential of heat pumps. Moreover since late autumn 2014, heat-pump sales have faced the obstacle of the low oil price, that is now around half of what it was in June 2014. Gas prices have stayed low too, and both have resulted in a recalibration of the boiler market in 2015. The gas boiler market remained flat, oil boilers posted a year-on-year growth of about 8%, and biomass sales fell by about 33%. The above brief description of the status of heat-pump and boiler markets mentions three major drivers for both renewable and traditional heating markets — Building Regulations, support schemes and energy prices; only energy prices are outside the Government’s power of decision. It is interesting to have a look at the historic sales development of boilers and main renewables in view of these drivers, as they provide market evidence to the story of the alleged UK Governments’ green commitment and reveal how the deployment of renewables in the UK homes is progressing. The information in the graph (Fig 1) can be summarised in a few sentences. It never takes long for the boiler market to receive support ,and as soon as it gets into troubles the Government provides an effective support. Once an important part of the heating market, solar thermal fell victim to the short-lasting rush towards PV systems and, faced with lack of effective help, did not recover after. Heat pumps kept making slow but steady inroads to the market until the long awaited domestic RHI delivered a blow of badly balanced feed-in-tariffs that further weakened the already low confidence of the players in the value chain. The up and down rides of the boiler market between 2009 and 2013 came as a result of the economic recession and related drastic fall in the number of newly built dwellings. After the market plummeted in 2011 and 2012 it received a boost of ECO obligation, a programme that, like a previous scrappage scheme applied in 2010, has turned out to be very effective. It has raised the market to the heights of 1.7 million units sold, the level not seen in the UK since 2007. Solar thermal has never enjoyed a great interest from the policy makers but had been doing well as long as the Zero Carbon Homes plan was considered a credible future. When this plan was fading and photo-voltaic installations received the support of high feed-in-tariffs and quickly decreasing investment cost, the solar-thermal market experienced a long ride downwards, with 2015 sales representing under a third of what they were in 2010. The UK is not the only country where solar thermal has suffered from the excessive support and uptake of photovoltaic systems. Germany represents probably the most prominent case of such development. The biggest European solar-thermal market sold more than two million square metres in 2008, which shrunk by more than 60% by 2015. Fig 1: A declining domestic-boiler market very quickly receives Government support. Although in both countries many are eager to blame the excessively high feed-in-tariffs, in Germany, as in the UK, it was in fact the combination of available Feed-in Tariff (FiT), falling product and installation cost and rising electricity prices that have caused such damage to the solar-thermal markets. Nevertheless in Germany the installation of solar thermal has all along been supported by changes in building regulations that enforced the use of renewable energy sources. In the UK no such regulation is in place, and solar thermal has gradually disappeared from the roofs of the newly built homes. In the meantime the attitude towards heat pumps has been ambiguous and cautious. Various support schemes have been introduced with the aim of increasing their penetration, but none of them has really provided a boost good enough to enable heat pumps to become a mainstream heating product. Heat pumps have been included in the RHPP (Renewable Heat Premium Payment) that provided one-off financial support before the domestic RHI became effective) but both the RHPP and the domestic RHI have been treated as a Cinderella of the heating market. Low payments and restrictions in the end-user eligibility for RHPP as well as disproportionally low FiT during the initial phase of residential RHI have exposed the Government reluctance towards enabling wider use of renewables by domestic end user. Big declarations have not gone hand in hand with effective actions. The widely quoted target of a million heat pumps sold by 2020 that was making headlines in 2010 has remained utopian, and the Government’s lack of coherent strategic approach has resulted so far in a ridiculously low share of renewable technologies sold in the overall residential heating market. 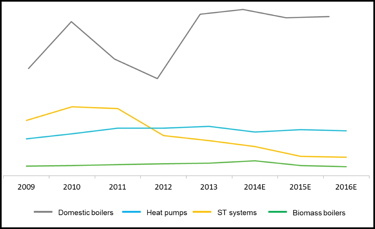 Sales of heat pumps accounted for just over 1% ,while combined solar thermal and boiler installations as well as biomass boilers were below 0.5%. 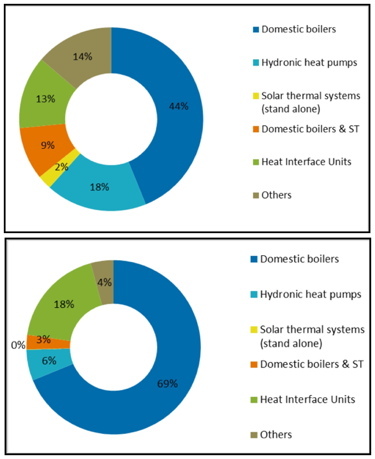 To provide some perspective, the share of heat pumps in the heating market within the EU area amounts to 7% while combined condensing boilers and solar thermal systems accounted for 5% and biomass boilers for 1% of the total market. Although such comparison might be undermined by some after Brexit, the climate-change effect has no geopolitical preferences and we can only hope that the UK legally binding targets for cutting CO2 emissions as written in the Fifth Carbon Budget will remain in place, providing the incentive for the UK to catch up with the more advanced heating markets of the continent. So far the support programmes, although meant to benefit the overall renewable market, provided scattered, short-lasting support for one or another technology. It is difficult to see them as part of a coherent strategy towards achieving the low-carbon future. Lack of commitment to a more fundamental change in the way homes are heated has also been proven by very cautious approach towards the Building Regulations. Renewable technologies face similar obstacles in the UK and in continental Europe. • Relatively low awareness among end users. But unlike the UK, the most important heating markets have building regulations that impose the use of renewable technologies in newly built houses. In Germany, France or Italy no new dwelling can be built these days without a heat pump or solar thermal, biomass boiler or heat-recovery ventilation. Moreover, there is also a clear path in view for what and when the next level of requirements will be introduced. Not so in the UK. The last amendment to the Building Regulations, which became effective in spring 2014, was a disappointment — bringing just 6%, instead of expected 8%, improvement in CO2 emissions for dwellings; there is a lot of uncertainty on what the next review might bring and when. With 2016 Zero Carbon Homes target dropped and Code for Sustainable Homes abandoned, there is no incentive to install renewable technologies in new homes. And again the gap between the UK and the European Union in this area is quite significant. Houses that are built today will still be there in 2050, and it looks as if there is little hope for the dominance of gas boilers in UK homes to decrease significantly. The Government published its strategy relating to the future decarbonising of heat in March 2013. It aims to support the installation of heat pumps in off-gas grid rural areas and of heat networks (mostly CHP based) in urban areas. With progressing decarbonisation of the grid the value of the CO2 savings that CHP based networks can provide will diminish. 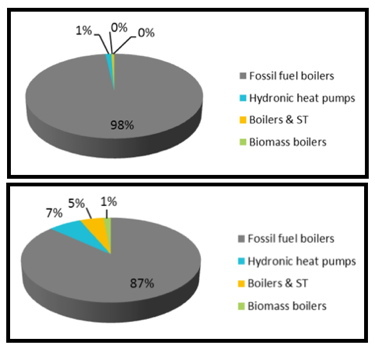 Should we consider CHP as a transition step towards renewable based heat networks or green electricity as a passport for wider adoption of heat pumps in the future? Somehow difficult to believe in view of the current market data and the experience of the gross misconception in the support provided to renewable energy based products so far. The strategy to decarbonise of heat and the targets of the fifth Carbon Budget will remain subjects of speculative discussion if no credible plan for their achievement will be in place. And for the moment no such long term action plan is in view. Fracking is on the agenda, and while green electricity comes at a cost, gas prices are predicted to remain relatively stable — resulting in an advantageous business case for gas-based solutions and subsequently causing resistance of the market to go ‘green’. The strategy of talking a lot and doing little will not be enough to overcome it. A more bold but thought-through and consequent approach will be needed to provide confidence to suppliers and end users and change the direction of the sales curves for renewables. We have gone through enough lessons to learn how to make it happen. Krystyna Dawson is senior manager for heating and renewables with BSRIA Worldwide Market Intelligence.